Jimmy Butler became the first player to be traded this season. Who could be next? The Crossover takes a closer look at the five best trade chips in the NBA. Jimmy Butler pouted his way to the first major first major trade of the NBA season, finding presumably greener pastures in Philadelphia. But don’t expect Butler to be the only major name shipped before February’s trade deadline. A number of quality players are on the last year of their respective contracts, leaving teams with a dilemma similar to that of the Timberwolves with Butler: trade their asset now and recoup some value before free agency, or wait things out and hope a combination of loyalty and money can keep a player from darting to another team. There’s been no shortage of big-name deals in recent seasons. Blake Griffin was traded to Detroit in January, while DeMarcus Cousins’s tenure in Sacramento ended with a trade 11 months prior in February 2017. Butler could be the first in a string of dominos to fall. So which impact pieces could be dealt over the next few months? We broke down five potential candidates. Walker projects to be the biggest fish in the trade market. The UConn product is having the best season of his career in 2018–19, pouring in 27.9 points per game while shooting a career-high from the field and 38.3% from three. He’s an expiring contract, too. Charlotte can offer the largest contract to Walker—five years, $188 million—yet it’s likely the former NCAA champion will search for a better situation after failing to win a playoff series in each of his first seven seasons. There won’t be a shortage of suitors should Charlotte opt to deal Walker. The Lakers would be expected to enter the mix, seeking a proven secondary scorer alongside LeBron James. Walker can mirror Kyrie Irving’s impact next to James, providing a clutch shot-maker with isolation credentials. Sacrificing Kyle Kuzma or Brandon Ingram (or perhaps a point-guard swap involving Lonzo Ball) could get a deal done. Other intriguing destinations? Perhaps Philadelphia isn’t done star shopping. The 76ers own Miami’s unprotected 2021 first-round pick, and perhaps the Hornets will attempt to revive Markelle Fultz’s career. San Antonio could look to add another backcourt scorer, too, and the Spurs have the young capital to make a deal. Expect a robust market for the two-time All-Star. Charlotte’s cap sheet is ugly outside of Walker. 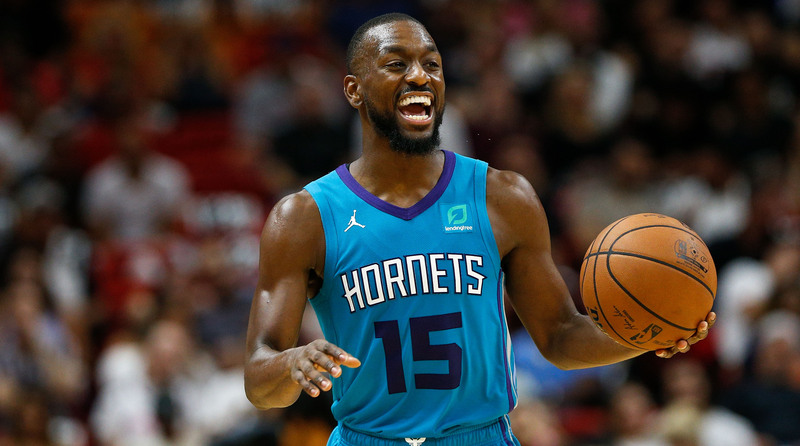 Bismack Biyombo has a $17 million option for 2019–20 that he will likely accept, and the same goes for Michael Kidd-Gilchrist at $13 million. The Hornets owe an additional $15 million to Marvin Williams and $14.5 million to Cody Zeller. The most egregious deal belongs to Nic Batum, who is slated to earn $25.6 million next season. If Charlotte can attach one of the aforementioned contracts to a Walker deal, it will go a long way to mitigating the damage done during the Rich Cho era. Orlando has to end its frontcourt logjam at some point, right? The Magic are devoid of capable point guards while stacked with forwards and centers, struggling to find minutes for the quarter of Vucevic, Aaron Gordon, Mo Bamba and Jonathan Isaac. Acquiring a guard for the expiring Vucevic will help even things out. Vucevic isn’t a stretch five that will extend beyond the three-point line, but he’s a canny interior presence and reliable past the foul line. He’s made over 45% of attempts between 16 and 22 feet in four of the last five seasons, and he’d be an impactful pick-and-pop presence with a better point guard. Vucevic has shown improved mobility as an interior defender this season, evolving from his previous years as a liability on the defensive end. Philadelphia is once again a fit after shipping Dario Saric in the Butler deal. Out West, Portland could make an intriguing trade partner. A third scorer outside of the dynamic Lillard-McCollum duo could help lighten the offensive load. The Jusuf Nurkic experiment has been a mixed bag thus far—especially in last season’s round one sweep to New Orleans—and while Zach Collins is having his best year to date, another impact big could vault the Blazers to the second spot in the West. Aaron Gordon would draw a more significant haul than Vucevic. He has a decelerated contract through 2021–22 (including just $16 million in the final year) and Gordon has proven to be a more complete player with an expanding offensive game. Yet unless a team bites and sends back an significant haul, Vucevic is the more likely and more reasonable trade chip. Ariza could very well get the best of both worlds. He cashed out of Houston and signed a one-year, $15 million deal with the Suns in July, bolting from a Western contender to bottom feeder. Yet as the calendar turns to 2019, Ariza may have his cake and eat it, too, taking his $15 million to a contender gunning for the Finals. The most natural fit is Ariza’s former team, the Rockets. Houston’s start to the season has been a touch better than disastrous, with Mike D’Antoni’s squad ranking No. 29 in points per game and No. 24 in offensive rating. Ariza’s minutes from last season have been largely replaced by James Ennis and a now-scapegoated Carmelo Anthony. As for the other wings, Eric Gordon is shooting 23.1% from three while Gerald Green is a shade better at 25.9%. After reportedly offering four first-round picks for Butler, one first could suffice for the expiring Ariza. Ariza has provided a veteran presence in Phoenix’s locker room, and he’s largely the same player he was for the previous 14 seasons. 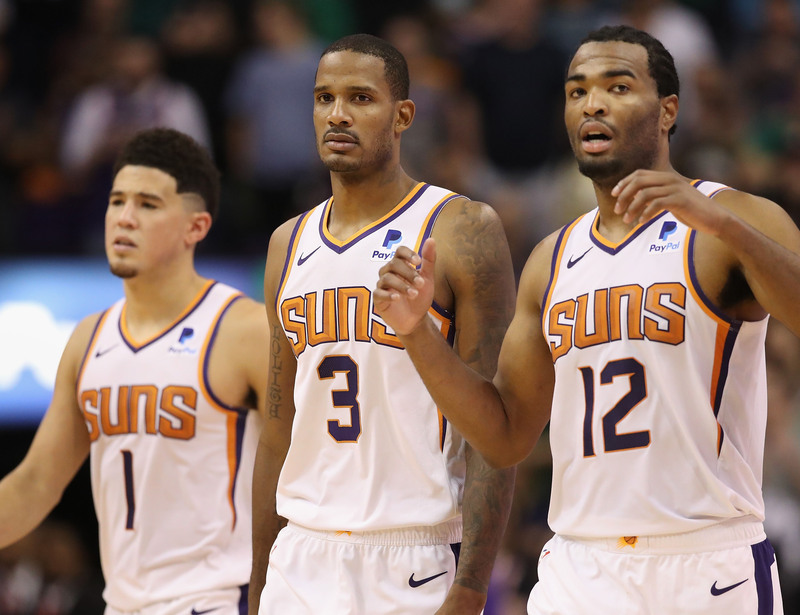 A parting makes sense for both sides as Phoenix creeps toward the top of the lottery. Houston should be inclined to push for a reunion. If the Rockets don’t bite, another contender will. Favors is the first player on our list who suits up for a contender, so shipping him wouldn’t come in a firesale. Don’t let Utah’s 6–6 start fool you. The Jazz are still entrenched in the West’s second tier, a large group behind Golden State. And while the former No. 3 overall pick is still a productive post presence, he feels out of place in Utah. Favors isn’t a natural frontcourt partner for the paint-bound Rudy Gobert, and Utah’s spacing issues become more glaring in lineups featuring Gobert, Favors and Ricky Rubio. The Favors-Rubio pairing has resulted in a negative-9.9 net rating this season, while Favors and Gobert’s net rating is negative-2.1. Favors is likely to be the odd-man-out in Utah’s rotation. Utah would be well-served by an influx of athleticism in the frontcourt. The group is a bit plodding with Gobert joined by Favors and Joe Ingles, and Jae Crowder isn’t a burner either. An off-the-bounce four could do wonders for their team structure. Favors earns $16.9 million in each of the next two seasons, but that figure is a bit misleading. His salary is non-guaranteed for 2019–20, allowing an out for teams who view him as an expiring. The Jazz may need to attach a pick to dump Favors, but if they can find a better frontcourt mate for Gobert, it will be prudent to send the draft capital to make a deal. Dragic provided a smooth transition from the Big 3 era in Miami, a stable cog since joining the Heat in 2014–15. The Slovenian doesn’t have the same burst as he did during his Phoenix days, but he’s still an accomplished floor general, a heady veteran who excels finishing over the trees and finding rolling centers in the pick-and-roll. But the Heat continue to trend younger outside of Dragic, increasingly relying on Josh Richardson and Rodney McGruder as leading playmakers. And without the cap room to land a big fish in free agency, continuing to acquire young assets looks like the path moving forward, leaving Dragic as a relic from another era. Like Walker, the Lakers could be in play for Dragic, as could Philadelphia. If Pat Riley is intrigued by Ball or Fultz, he’d be inclined to deal the former All-Star. However, Dragic’s player option for 2019–20 complicates matters. Los Angeles may balk at a Dragic deal in an attempt to free as much cap space as possible for next summer. Ditto for Philly. A pair of scuffling teams could provide cushy landing spots. Both Memphis and Washington have expensive point guards (Mike Conley and John Wall) and may look for an out on their long-term deals. Dragic would allow those teams to stay afloat while not commiting to a massive contract. Miami could regret Wall or Conley’s cap hit in the 2020’s, but for a team sitting out next summer’s free-agent frenzy, a trade is likely their only path to landing a star. Pat Riley has never hesitated to be bold. If he can acquire Wall or Conley, sacrificing Dragic would be a minor price.